Researchers and health professionals are re-thinking the causes of rheumatic fever after studies by Maurice Wilkins Centre investigators confirmed a link between skin infections and the disease. Their findings have potential implications for health prevention programmes around the world. For decades, health professionals have believed that 'strep throat' - a throat infection caused by the Group A streptococcus (GAS) bacteria - was solely responsible for the development of rheumatic fever. Growing evidence, however, suggests GAS skin infections may also be a precursor to the disease. "A link between skin infections and rheumatic fever was first mooted by Australians around 15 years ago, based on data from Aboriginal populations," explains Nikki Moreland, an associate investigator with the Maurice Wilkins Centre. Māori and Pacific children in New Zealand, and Aboriginal children in Australia, suffer some of the highest rates of the disease in the world. Inflammation associated with rheumatic fever can lead to rheumatic heart disease and long-term damage to heart valves. Working with fellow investigators Dr Debbie Williamson from ESR and Professor Michael Baker from the University of Otago, and several Australian collaborators, Nikki and the team sought to gather evidence to investigate the role of skin infections in rheumatic fever. 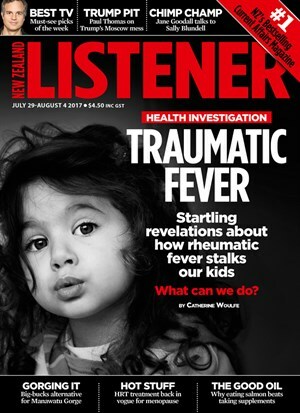 Maurice Wilkins Centre rheumatic fever research was covered in the New Zealand Listener (Jul 29 to Aug 4, 2017 issue). The team studied GAS isolates in throat swabs collected from children with rheumatic fever in New Zealand, and found that many had characteristics normally associated with skin infection. "That was the first thing that made us go, "How did they get there and why do they look like skins strains?" says Nikki. The researchers then investigated GAS throat and skin isolates from children living in South Auckland, a high-risk area for rheumatic fever, and children from Dunedin, where there is no occurrence of the disease. "In the high-risk children, we saw a much larger proportion of skin-type strains, in both throat and skin infections, but in low-risk children, we hardly saw any of those strains at all." Another piece of the puzzle cam after Northland GP Dr Lance O'Sullivan gave a talk at the University of Auckland. Lance has been instrumental in rolling out the rheumatic fever primary prevention programme in Northland. During his visit, Lance described a case of rheumatic fever that had occurred in the absence of strep throat. After going back through his case notes, Lance discovered the patient had presented with a skin infection 4 weeks before developing rheumatic fever. The atypical presentation led to a published case report co-authored with Nikki. The findings are initiating an important dialogue about the role of skin infections in rheumatic fever that could ultimately lead to important changes in primary health prevention programmes. Armed with evidence about a long-suspected precursor to the disease, the investigators hope to initiate new research projects within MWC into the biological mechanisms and disease pathways behind GAS skin infections and rheumatic fever.